I don’t know you, but I’m sitting several rows back and can hear the high-pitched wail coming from your child just as clearly as if you were sitting right next to me. I don’t know what instigated the deafening scream that is resounding through the entire coach section of this moderate-sized aircraft. Perhaps you took away something gross and germ-infested that he was trying to put in his mouth. Maybe you forced him to sit back down when what he really wanted to do was roll on the floor in the airplane aisle. Or maybe his poor little ears are hurting because he’s inside a giant pressurized flying tube. 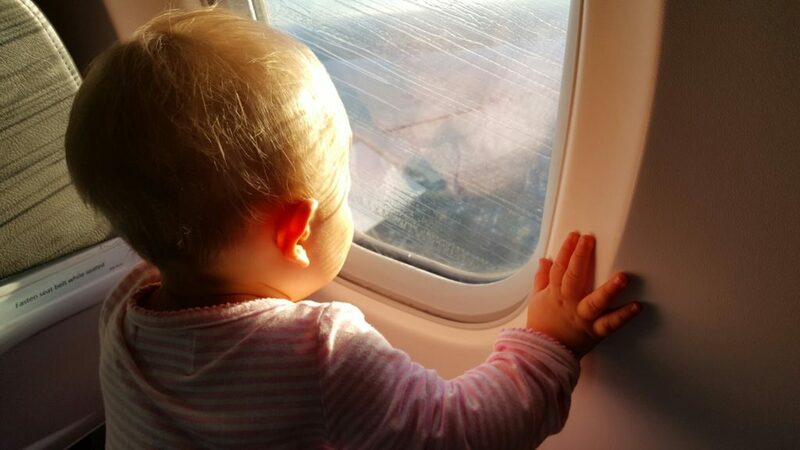 Flying with a baby is hard… on both the parent and the baby. Even from behind, I can tell you are embarrassed. I can tell you are on the verge of a full-fledged panic attack as I watch you frantically bounce and shoosh your little screamer to no avail. I know you think everyone in earshot of your kid is annoyed and ready to throw their free Biscoff cookies at you and your child. But I want you to know, your baby’s very public display of discontentment doesn’t bother me in the least. 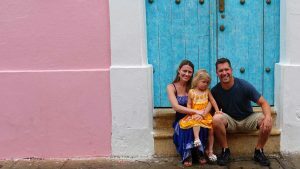 Maybe it would have bothered the old me, the childless traveler, who didn’t understand the hardships of traveling with children. But after only one year of having a pint-sized passenger in tow, I’d be much more inclined to offer a helping hand than toss my complimentary snack, which by the way makes a great teething wafer for fussy babies. The fact is, we’ve all been there… Whether in the grocery store, a restaurant or in the enclosed quarters of an airplane. Every mom has experienced a similar and equally mortifying moment in which she is rendered completely helpless and is at the mercy of a tinier version of herself who is in the middle of an all out meltdown. Before the meltdown… Bow still in tact. For me, that moment happened on a mid-day flight from North Carolina back home to Oklahoma. My daughter, Avery, was 10 months old at the time. I had dressed her that morning in comfortable but stylish clothes, complete with a matching bow. 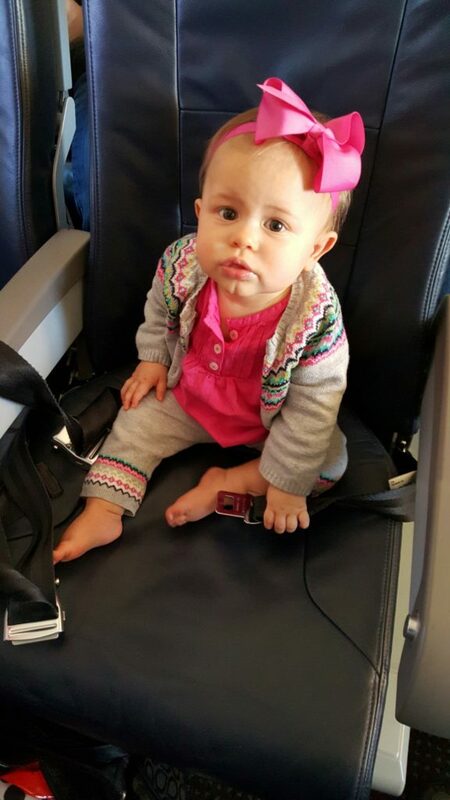 About halfway through the flight Avery decided she did not want to wear her bow. But before I could successfully diffuse the situation, she yanked the headband forward in an attempt to remove it. The bow wouldn’t budge, so after yanking the band as far as possible, Avery released it. Much like a sling shot, that bow came flying back and popped her right in the face. Instantly, Avery went from zero to completely losing her flipping mind in a matter of a nanosecond. I held Avery close trying to comfort her, but she wasn’t having any of it. She must have felt betrayed by me for putting that contraption of torture on her head. I tried to walk her up and down the aisle to sooth her, but no sooner than I stood up that dang drink cart started encroaching on my row. And we all know you don’t leave your seat during the complimentary beverage service. I was trapped, with a screaming kid. I considered ordering a strong drink…. for everyone on the plane. How Avery now travels… without a bow. It took a solid 10 minutes to calm her down, but finally Avery’s screaming turned to quiet sobs, and eventually I had my angel back, and she dozed off in my arms. I learned a very valuable lesson from that flight. I learned even good little travelers (which she typically is) have bad days. And more importantly, I learned to never again put a bow on Avery when we travel.